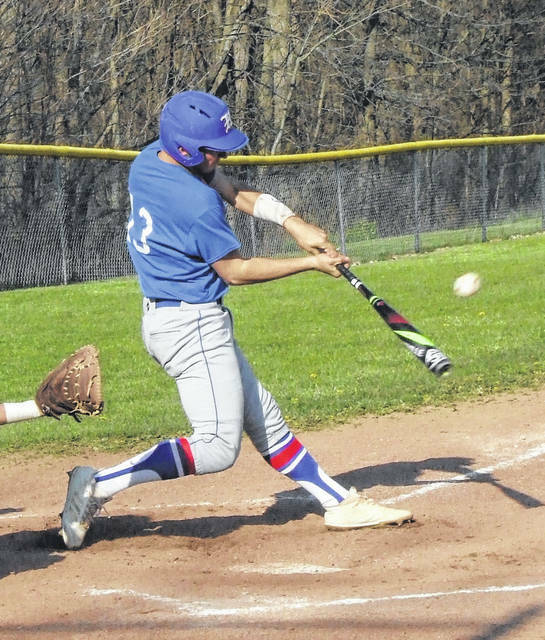 Two big innings boosted Highland past host Northmor by a 13-1 count in six innings in a Monday evening KMAC contest. The Scots broke open a 3-0 game with a five-run third inning. Then, with the score 8-1 going into the sixth, they tallied another five-run frame to go on top by 12 — an advantage they’d maintain through the bottom of the inning to claim a big league win on the road. Highland led off the game with a Tate Tobin solo shot to immediately hold a 1-0 advantage. Two more runs would cross home plate in the second inning, as defensive miscues hurt Northmor. Knight coach Buck Workman noted his team had a chance to retire Tobin on a foul ball in the first inning and then committed two errors in the second to assist the Scots in the second. Liam Garrett led off with a double and went all the way home on a Matt Reid bunt due to an errant throw. Two batters later, Sam LoPiccolo hit a single and Reid made it from second to home on another bad throw. While that lead would be enough for Scot starter Mack Anglin, who struck out 11, walked one and pitched a three-hitter, Highland would add on in the third inning to the chagrin of Knight coach Buck Workman. With one out in the third, the Scots got to Northmor starter Brayden Black. Jarin Vasquez hit a double and was driven in by Garrett. A single by Reid put runners on the corners and Lane Ballard would drive in both to make it 6-0. A LoPiccolo single put runners on the corners again, a ground ball by Drew Duncan was misfielded to bring in another run and Reese Weissenfluh tallied a run-scoring single to make it 8-0. Workman would then switch pitchers from Black to Mostyn Evans, who would induce a pair of pop-ups to end the inning with no further damage done. Unfortunately for the Knights, in the one inning they could do some damage of their own, Anglin did a fine job of getting out of a jam. In the bottom of the fourth, Evans led off with a single and was driven in by an Austin Wheeler double. Anglin then hit Ryland Thomas and Tyler Kegley in back-to-back at bats to load the bases with no one out. 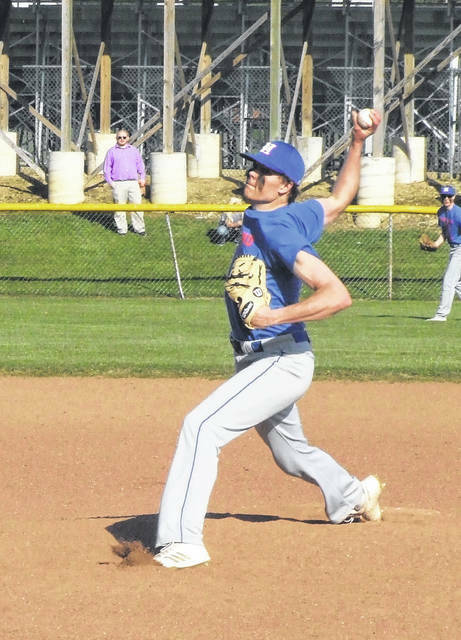 However, after a brief trip to the mound by one of his coaches, the Scot junior recorded three straight strikeouts to prevent Northmor from potentially getting back into the game. Kline was pleased with his pitchers’ poise. The Scots would finally get to Evans in the sixth inning, scoring five runs to finish on top by 12 runs. Workman noted that Highland’s hitters seemed to hone in on his guys the second trip through the order. Kline was happy to get a win, as his team is fighting to keep up with East Knox and Fredericktown in the KMAC race. Highland’s Mack Anglin pitched a fine game in leading Highland to a 13-1 win over Northmor Monday. 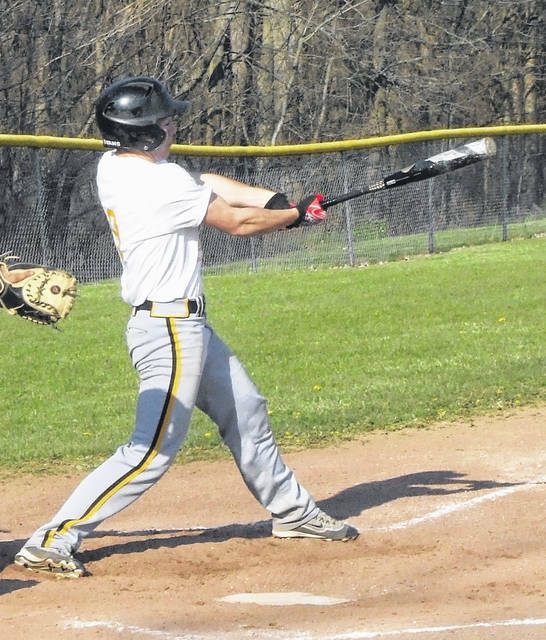 Northmor’s Mostyn Evans had a single and then scored for his team in the fourth inning. Lane Ballard had a strong night hitting, recording four RBIs on Monday.